The lucky people born in April have this beautiful glittering precious gem as their birthstone. Diamondsare one of the most desirable gemstones in the world and have been the object of obsessions for many years. Some come with a very large price tag but our buying team have sourced a collection of beautiful sparkles that wont break the bank. You can view our range of Diamonds here. Colour: Diamonds are most commonly colourless but in recent years colours are becoming more popular. Other colours include different shades of yellow, brown, green, blue, red's, pinks, greys and black. Nitrogen can create yellow, brown, green and black Diamonds and minute Boron traces give the blue hues. Appearance: Diamonds are generally a clear stone but flaws and inclusions do occur as little thread lines or speckles within the gemstones. The clearer the stone the more expensive the stone will be. Rarity: Made from Carbon this stone is a commonly used stone it is not considered a rare gemstone. However it is intensively mined due to its popularity and so deposits of this mineral are gradually decreasing. Truly colourless diamonds are the rarest form due to it being free of any impurities which can taint the colour. MOH Scale Hardness: This is the hardest mineral on earth measuring 10 on the MOH scale. A Diamond is a precious stone (as opposed to a semi-precious stone) due to its hardness. Sourced: Africa, Australia, Brazil, India, Russia, United States. FORMATION, MINING, CUTTING AND GRADING. Diamonds have been one of, if not the most popular of the gemstones for hundreds of years. A diamond is formed from carbon (graphite) which crystallises under immense pressure and high temperatures. They are most likely to be found up to 50 miles underground. It is not sensitive to chemicals and because of the strong uniform bonding in its particles it is extremely strong. The earliest diamonds were found in India in 4th century BC, but the youngest of these deposits were formed 900 million years ago! The word diamond comes from the Greek word "Adamas" which means "unconquerable" referring to its strength. Diamonds are most commonly mined in Africa, Australia, Brazil, India, Russia and United States. There has been a lot of controversy around the mining of diamonds due to many working conditions being unsafe. Unfortunately, unethical practices have been exposed such as the use of small children as mining labourers. Because of this around 80% of the diamond trade and production is now managed and controlled by "The diamond Producers Association" and the "Central Selling Organisation". These organisations have divisions in place to assess the stones and conditions in which they are mined. Here at Kernowcraft we are very careful where we buy our diamonds from so we can guarantee that they are conflict free. Only around 20% of all diamonds mined are used for jewellery. The majority are used in industry for various uses such as cutting, milling and grinding other materials. They are also used for scientific purposes to gauge hardness of other materials. Diamonds for jewellery making are cut and graded according to the four C's - Colour, Clarity, Cut and Carat weight. Diamond cuts have been developed over the years to show the best qualities and reflect as much light as possible through the stone. The more facets the stone has the more it catches the light and sparkles. The most popular cut is the Brilliant Cut - this consists of 58 facets, 33 on the crown and 25 on the pavilion. Not all stones can be cut in this way due to inclusions or fault lines. Diamond cutters will assess stones for many hours, testing them under microscopes to cut each diamond in the best way possible before making the decision on which style is most suited to its natural attributes and making the first cut. Take the cutter of the infamous Cullinan Diamond collection - the biggest clear diamond ever to be found. The cutter was so nervous cutting the stone from its raw form that he fainted with the first cut! Click here to view our amazing replica range of the Cullinan Diamond Series. Today the world’s diamond deposits are now slowly becoming depleted. Less than 20% of the diamonds that are mined are of gem quality of which less than 2% are considered “investment diamonds”. Typically, more than 250 tons of ore must be mined in order to produce a one-carat, gem-quality stone. MYTHOLOGY, HEALING AND SPIRITUAL QUALITIES. The Diamond is a symbol of purity. The light that it generates is said to bond relationships and bring love and clarity into a partnership. This amazing gemstone is said to be an amplifier of energy and is one of the few stones that does not require 're-charging'. It is also said to increase the energy of anything that it comes into contact with. However, when using this gemstone for energy and chakra reasons, care must be taken as a diamond can also increase negative energy. The "merciless" light of a diamond is said to pinpoint anything that is negative and requires transformation. 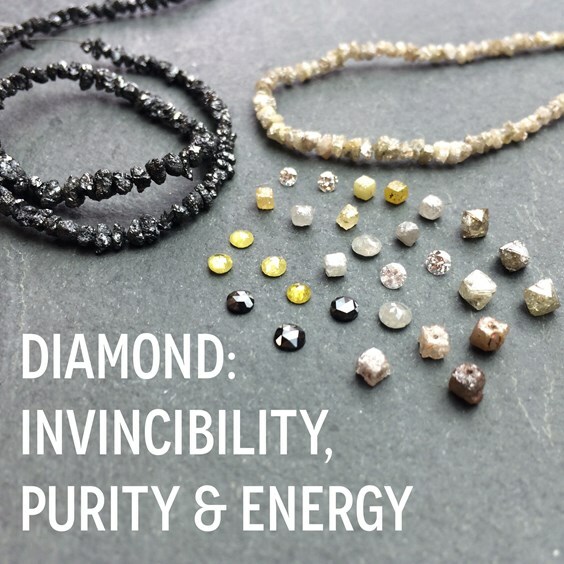 This can be tackled with the fearlessness, invincibility and fortitude that Diamond are also said to impart. Many believe that diamonds can help to clear emotional and mental pain and bring about new beginnings. Diamonds are thought to be able to help treat Glaucoma, clears sight, treat allergies and balance the metabolism, as well as have added benefits for the brain. It is said that the larger the stone the better it is at blocking electromagnetic stresses. The use of diamonds in jewellery was has been recorded as far back as 1477, when Archduke Maximilian of Austria proposed to Mary of Burgundy. Although engagement rings were common at this time, Diamonds were a rarity and were reserved for royalty and the upper elite class for many, many years. The use of diamonds in jewellery slowly grew as the trading connections between the far flung corners of the world became more common and usable. In 1947 De Beers launched arguably the most successful marketing campaign in jewellery history "A diamond Is Forever" - suggesting that a diamond was the only stone to present for a marriage proposal. This led to the popularity of the Diamond engagement ring that we still see today. 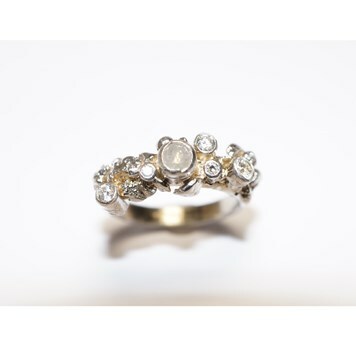 Jewellers then developed the diamond world by trying out new cuts and styles to make their rings different to others. They began showing the features of the gemstone off to their very best and giving us the many different styles of diamond that we know today. Diamonds have been used in Royal Jewellery for many years, the most spectacular of these are in museums so you can see the amazing stones up close. They really do have to be seen to be appreciated, the skills that the cutters and setters had back hundreds of years ago really are impressive. Diamonds are still one of the most popular gemstones used in jewellery design today. They are such a truly beautiful stone, it is easy to see why. 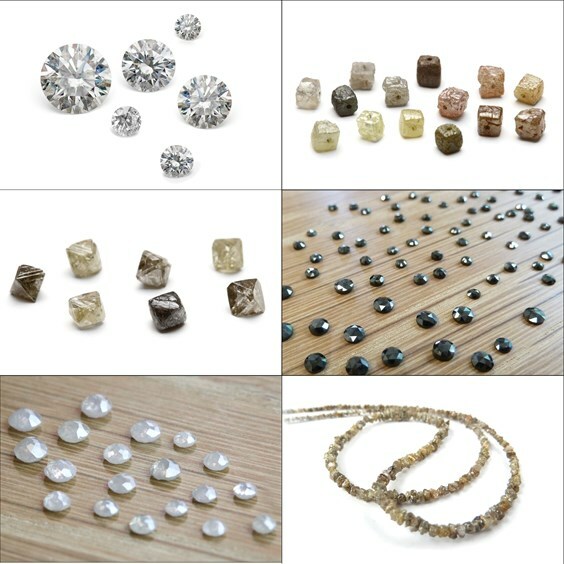 To view all of our diamonds for jewellery making Click Here. Below are a few of our favourite non-traditional diamond jewellery designs by some of our customers and staff using a range of the types of diamond that we stock. 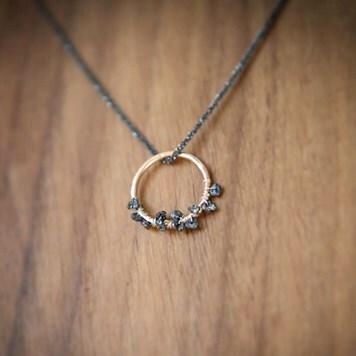 This necklace was made for a Cameo photo to our Black Diamond Natural Nugget Beads. This stunning, contemporary ring by jeweller Laure Filho uses one of our Silver, Grey Diamond Rose Cut Cabochons as its centre piece. 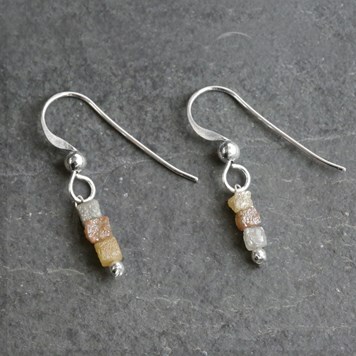 These pretty earring were made as a cameo photo for our Rough Diamond Natural Crystal Cube Beads. 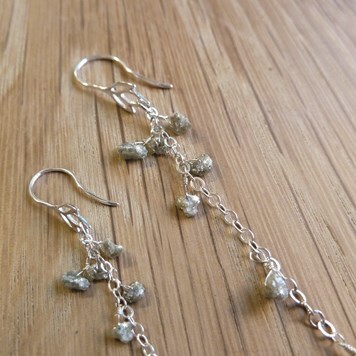 These earrings were made for a cameo photo for our Silver Diamond Natural Rough Nugget Beads. These amazing cufflinks where made by jeweller Caroline Jones using our Black Diamond Rose Cut Cabochons. 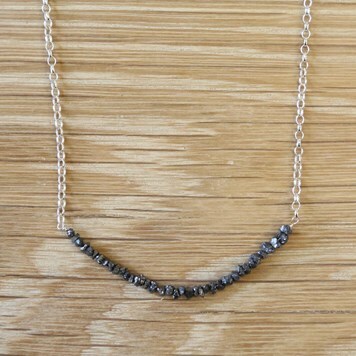 This stunning necklace was made by jewellery brand When Catie Met Soda using our Natural Black Diamond Rough Nugget Beads. We have created an April Birthstone Make The Look - a step by step jewellery making project for all levels. 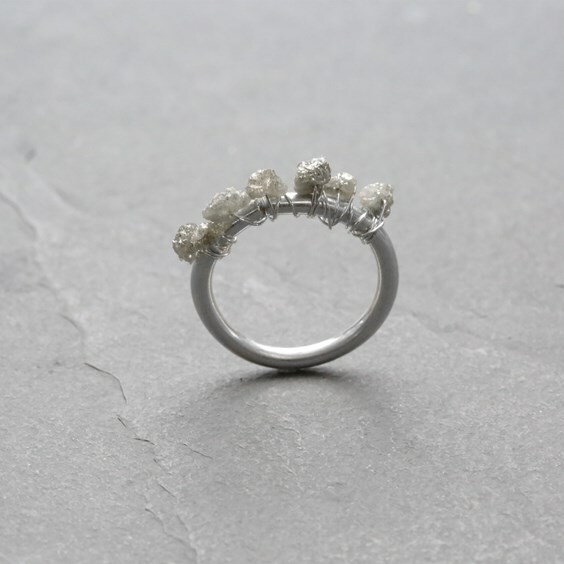 We have used our Rough diamond Nugget Beads to make a contemporary style diamond Ring. This ring can be a surprisingly easy make, with a way to create it with no soldering involved. However, it can be advanced with soldering and texturing techniques to make a more high quality ring. It all depends on your access to tools! 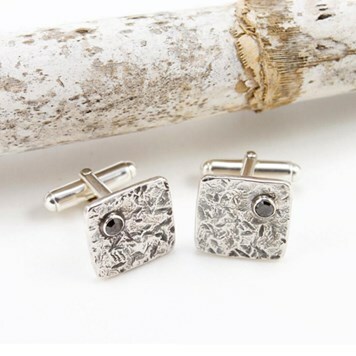 We have used our Silver Rough Diamond Nugget Beads, but you can choose from Black or Champagne. This project could also be adapted to have slightly different style. For example, you could try wrapping one of our Natural Rough Diamonds Cube Beads around the ring band! Click here to view this step by step project.